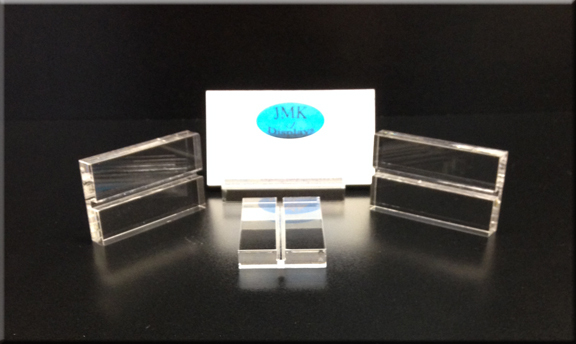 We offer a great little clear acrylic card holder and stand. Perfect for business cards, table setting numbers, and organizing party table seating for weddings, birthdays, social events. Keep your company and guests seating chart organized. 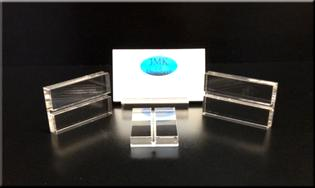 These are produced from 3/8"thick clear acrylic and have a 1/8" wide slot for displaying your table number or business card. They are 2 1/2"Long x 1 1/2"Wide with all edges polished for a clean clear modern look. Quantity of stands are reflected in the drop down for cart purchase. Need a larger quantity then 25 pieces? Contact us for a quote on quantity discounts.